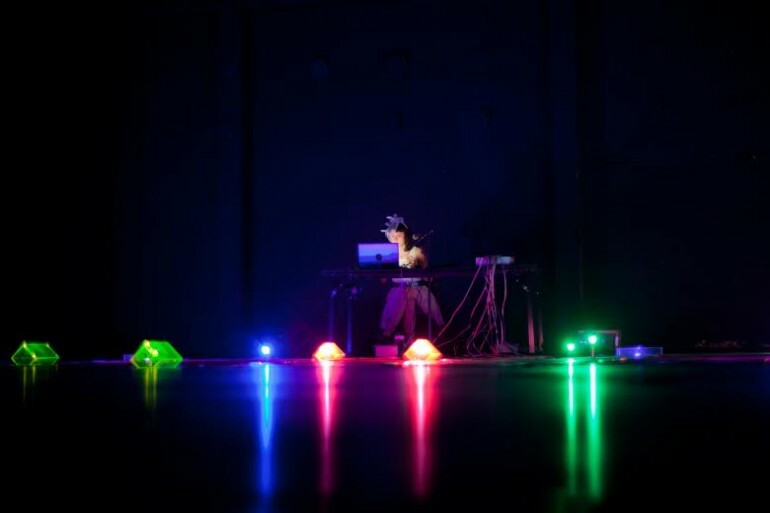 The performance explores the synesthesic relation between sound/music with color, as well as the potential ways to represent a vibrating space from the relation between light and sound frequencies. The compositions are based on an audiovisual relation that is controlled and performed live, and on the way that this changing relation affects and transforms the perception of space and time. The result is a sonic-graphical and constantly transforming composition of analog/digital sounds, extreme vocals, color intensities and spatial vibrations. This work is also an experiment on how a performance can be a collective meditation instrument. The audience’s senses are to be immersed into an audiovisual physical changing flow of waves as they are guided into an ephemeral, virtual and hypnotic journey. Maria Paz is an artist, composer and designer born in Bogota, Colombia (1981). Exotikdot is her artistic pseudonym as well as the name of her solo-electronics band. She grew up and lived in the capital until the age of 19, when she moved to Europe seeking for an artistic education. She studied burlesque theater in Paris, obtained a BA and MA at the Sculpture School of ENSAV La Cambre in Brussels, was a guest student at the Media Arts School of the Royal Danish Academy of Arts in Copenhagen, and obtained an MFA in Experience Design at Konstfack in Stockholm. Her nomadic lifestyle as well as her interdisciplinary approach has deeply influenced her work as an artist. She has been performing and participating in several collective and solo exhibitions and festivals in Belgium, France, Denmark, Sweden and Japan.